2006 Pontiac GTOs. Lot 5 of 29. CLICK-> Phantom Black 2006 GTO, interior view. This one has the standard black leather interior and optional 6-speed manual transmission. CLICK-> Jim Taylor owns both of these Goats - a Torrid Red 2006 GTO and a green 1968 GTO hardtop. Jim tells us about them, "I added a new Goat to the herd and it looks like they get along. Has anybody tried building a new herd from good breeding stock? The green one is a 462 Jim Butler stroker Goat. It looks stock until you step on the gas then it looks small, but it's just because of the distance. The slow 400hp 2006 is my commuter car. I have not been late to work since I bought it. They are tons of fun - about four tons actually." CLICK-> Impulse Blue 2006 GTO owned by Jared Senn from Layton, Utah. It has the optional blue leather interior. Jared tells us more, "I special ordered this beauty from Las Vegas. I had to have it! I recently got back from a deployment, had the cash for the down payment, so here she is, in my driveway. BTW her name is Stacie, look again and think of the girl with tight fitting jeans, a tanktop, wearing her hair under a hat in a pony tail." CLICK-> Impulse Blue 2006 GTO, left rear view. 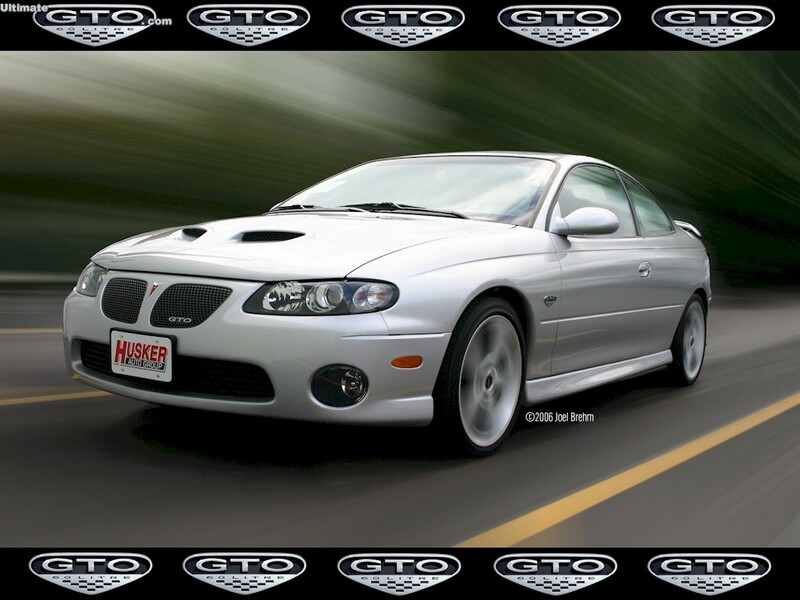 CLICK-> Greg Dykes owns this Torrid Red 2006 GTO. CLICK-> Joel Brehm photoshopped his Quicksilver 2006 GTO into its native environment - Going Real Fast! He purchased it 6/6/06. We have this shot in two additional sizes; 800-600 wallpaper and 1024-768 wallpaper. Note that Joel Brehm retains the copyright to this particular image. So if you want to use it for something, ya better ask him first. CLICK-> Spice Red 2006 GTO owned by Chad Warkentin from McLoud, Oklahoma. Chad had this to share, "I bought it 7-1-06 from Bob Howard Pontiac in Edmond, Oklahoma. I drove off showroom floor and it was the only GTO they had left at that point. A 6-speed manual and Spice Red which is what I wanted. The dealer chromed the stock 17 inch wheels which are really starting to grow on me. It is a total blast to drive and thank God for cruise control. I can be going 85 in a matter of seconds and not even realize it. It's a far cry from cruising down the highway in my 64 GTO at 3200 rpm!" CLICK-> A close-up of those dealer chromed stock 17 inch wheels. CLICK-> Brazen Orange 2006 GTO owned by Jim Barrett from Hudson, Wisconsin. Jim tells us, "I traded in a 2004 Barbados Blue GTO. The 04 was an automatic, this is the manual. What a difference 50hp and a stick make. These are awesome cars. Would love to find an affordable 70-72 GTO, but will tinker with my 73 Grand Prix until that time." CLICK-> This car fits the definition of Brazen I looked up, which is: audacious: unrestrained by convention or propriety; "an audacious trick to pull"; "brazen arrogance"; "the modern world with its quick material successes and insolent belief in the boundless possibilities of progress"- Bertrand Russell. Also made of or resembling brass (as in color or hardness). CLICK-> Brazen Orange 2006 GTO, left rear view. CLICK-> Brazen Orange 2006 GTO, rear end view. CLICK-> Jim has since added a set of 18 inch wheels to his Brazen Orange 2006 GTO. Jim tells us more, "The look of these grew on me after I bought my car. So much so, I had to find a set. These were almost new with less than 800 miles on them. The only option I am considering adding is the JHP gauges." CLICK-> Another shot of Jim's Goat with new 18 inch wheels. Says Spencer - "I can't believe how extensive the information is on the color coding for interior and exterior and the decoding of the VIN numbers. It's great."